I love getting a good manicure. I have shaky hands, so I'm not very good at painting my own nails. So I love treating myself to a nice manicure. A couple years ago, I tried getting gel nails. I loved them, because they lasted so long and looked great. With regular nail polish, even high quality ones, I rarely had more than 1 or two days without a chip. I tried shellac, but that only gave me a few more days of wear - maximum 5 days. I've even tried nail stickers. They gave me about the same amount of wear as shellac. 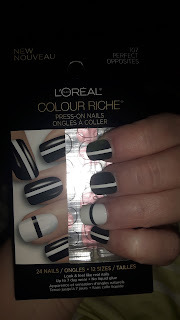 On a whim, while in a drug store waiting for a prescription, I decided to pick up some press on nails and give them a try. I bought a few different varieties, and I decided I would review them for the blog in case any one was looking for recommendations!